Today we start looking at Christmas carols with "In the Bleak Midwinter." The Jewish calendar has 12 regular months, like Nissan, which is the month Passover comes in, and Teves, which is the month that Hanukkah comes in. It's fundamentally a lunar calendar, but since the lunar month is 29.5 days long and the lunar year rapidly gets out of sync with the solar year, there's a fairly complicated system of leap months. I believe we are currently in the year 5770. The point is that the Biblical writers could have given us the date for every recorded event, but they normally didn't, apparently not considering that the dates were all that important. One event that we don't know the date of – or even the month or season – is Jesus' birth; however, the Christ mass has been celebrated on Dec. 25 since about the year 350 A.D. Since there's no scriptural basis for the winter, snow, or ice in this carol, our reading is about Zechariah and the angel Gabriel, who announced the forthcoming birth of John the Baptist. The first three lines of Ave Maria come from today's scripture reading in Luke. Notice that Gabriel has been sent to Mary as well as to Zechariah, but since she doesn't question his credentials, he's nicer to her. Nunc et in hora mortis nostrae now and at the hour of our death. The Annunciation, by Bartolomé Esteban Murillo, excellently shows the humility of the Virgin and the unaccustomed gentleness of the Archangel Gabriel. You may remember that Gabriel was a little short-tempered with Zachariah’s question (Luke 1:19-20); however, he treats Mary kindly and patiently. All that is a good reflection of the scripture. Then Murillo gets carried away with baby angels, of whom I count at least eleven. Now, if you were paying attention during our study of Angels, you will not remember any baby angels. You will remember instead that most angels are scary, hard-working messengers, servants, and soldiers of Almighty God. I don’t know where the idea of these adorable little winged babies came from, nor the idea of the winged anorexic 16-year olds that we see more often today, but I can assure you that neither idea comes from the Bible! The bottom half of the painting is great, though. Previous Step. Next Step. "Annunciation" by Bartolomé Esteban Murillo, from the Gamble family Bible, now in the private collection of Regina Hunter. 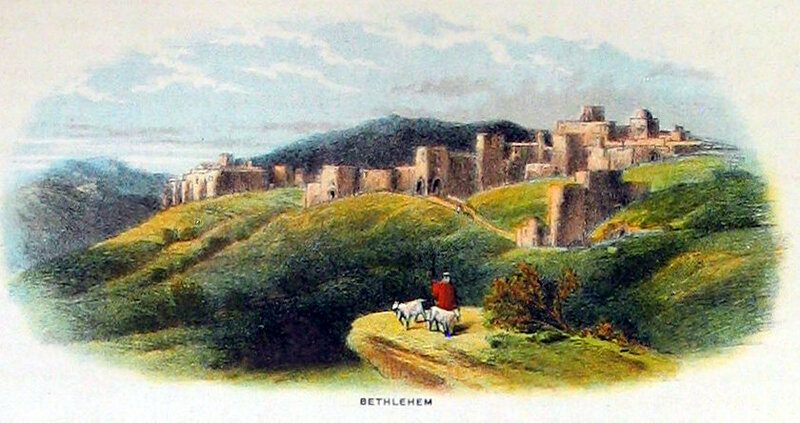 Bethlehem's primary importance came from its status as the hometown of King David and the prophecy of Micah that the Messiah would come from there. This made sense, because the Messiah was going to be a descendant of David. This is one reason the claim that Jesus was the Messiah met with some skepticism: he was from Nazareth, as far as anybody knew. Nathaniel said, "Can any good thing come from Nazareth?" (John 1:46) After Jesus gave sight to the man blind from birth, one objection made by the religious authorities was, "We don't know where he came from." The blind man sneered, "He gave sight to someone blind from birth, and you don't know where he came from?!" (John 9:29-30) Some people argued that in fact no one would know where the Messiah came from (apparently a minority view), and since they did know where Jesus was from (Nazareth), he couldn't be the Messiah (John 7:27). Ironically, they in fact didn't know where he was from – the little town of Bethlehem. Quick! What did the angels sing? Not "Alleluia" at all, but reather "Glory to God in the highest." The English "alleluia," as we all know by now, is a direct transfer from the Greek alleluia, which is a transliteration, not translation, of the Hebrew hallelujah. Whenever you see "Praise God!" in your Old Testament, you know that the Hebrew has hallelujah, which means, "y'all praise God!" Caeser Augustus ruled the Roman empire from 31 BC until AD 14. Herod the Great, who ruled Judea when Jesus was born, died about 4 BC. There is some disagreement about whether Quirinius was "governor" or "governing" in Syria at the time of Jesus' birth; apparently he really was the "governor" at least once, but that time seems to have been too late for the scripture below. Consequently many historians have thought that Luke was mistaken; more recent evidence suggests that Quirinius may have been governor or governing in Syria twice, the earlier time being the one Luke is referring to. Luke has a well-deserved reputation for meticulous accuracy, so I suspect that the historians were missing some of the facts, and that Quirinius was doing something in Syria before the death of Herod. I love this! The International Standard Version actually has "Army" in this passage, which is what a host is! Have you noticed that the first thing angels say is "Don't be afraid"? That's because many of them are soldiers, and they appear out of nowhere, carrying a sword, sometimes a flaming sword! To be honest, the soldier angels are the least scary of the bunch. No wonder people are terrified. The whole image of an angel as a somewhat anorexic-looking 16-year-old has no basis in scripture. and had to have it explained to me. What's a "noel," does anybody know? I didn't, so I looked it up. It means "Christmas carol" (or just "Christmas'). It's not actually what the angel said, but what he did say was a Christmas carol of sorts, and he did indeed say it to shepherds out in the fields. There's a one in four chance that it was winter, as previously discussed. Thanks to all who wrote saying they didn't understand the symbol. Now I know I'm in good company in not seeing immediately that it means "No L," that is, "Noel." And for those of you who did get it, you can take satisfaction in knowing that you are above-average in perspicacity. Copyright 2009, 2011, 2015, 2016 by Regina L. Hunter. All rights reserved. This page has been prepared for the web site by RPB. 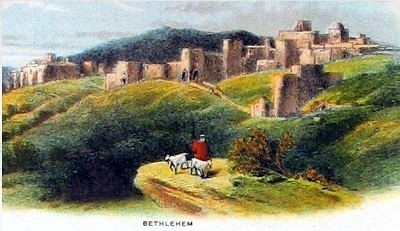 The illustration showing Bethlehem is from the Binns family Bible, now in the private collection of Regina L. Hunter.